While researching possible consumer VPN offerings, I was pleasantly surprised to find a candid acknowledgment that borders apply to the Internet. Although I have used employer supplied VPNs, I was recently encouraged to re-consider the role of consumer VPN services. I'm especially interested in making it harder for "casual" hackers to interrupt communications when I connect to various cloud services via public WiFi. It's been a few years since I've looked at the state of the consumer VPN market, so I started with typical review articles aimed at consumers. In reading VPN selling materials and third party reviews, I was slightly surprised to discover the very strong and common emphasis on the ability to use a VPN to mask one's geolocation - the ability of an end user in Country A to use a VPN for the purpose of pretending to be in Country B and thereby circumvent content distribution controls. In the past, I have described this as "online smuggling" or "internet smuggling". The trouble is that Netflix and similar streaming services are getting wise to the scam. In my testing, I found that Netflix blocked streaming more often than not when I was using a VPN. There are a few exceptions, but I also have Netflix is actively working to protect its content deals. What works today may not work tomorrow. You'll note that I said "scam," above, and that is more or less true. Just because you paid for Netflix in one place does not mean you're entitled to the content available on the same service but in a different location. Media distribution and rights are messy and complicated. You may or may not agree with the laws and terms of service surrounding media streaming, but you should definitely be aware that they exist and understand when you're taking the risk of breaking them. Reportage of Internet infrastructure has moved gradually over the years from "the Internet is borderless", to "it is impossible to apply borders to the Internet", to "it is difficult to enforce borders on the Internet". Now we see "Borders still exist on the web". Furthermore, this author has helpfully tested the border circumvention technology as applied to a group of persons who are trying to enforce borders - online streaming media services - and found that anti-smuggling technologies are getting better. Rather than wasting time saying silly things like "I told you so", I shall instead congratulate the growing number of people who are beginning to internalise and appreciate the reality of Internet Borders. Oh, why not. I told you so! Online fraud is a major problem. Many of these frauds cross international borders. Criminals “over there” steal money from victims “over here”. But there’s a relatively simple change that email software and service providers could make that could have a significant impact on this type of fraud: let’s tell end users when an email was transmitted from a foreign mail server. Last week, the UK Office of National Statistics released its first-ever estimates of fraud and computer crime. The numbers are sobering. In the 12-month period ending March 2016, the ONS estimates that 2 million computer crimes and 3.8 million frauds were perpetrated on victims in England and Wales. A staff member at ONS familiar with the survey expressed the (informal) view that approximately one half of these frauds were conducted using some form of online communication while the remainder used other methods such as telephone or traditional post. The police face enormous challenges trying to enforce the law against criminals who commit fraud at a distance. Keeping in mind that more than 90% of these frauds produce a financial loss of less than £1,000 (67% produce losses of less than £100), there are limited circumstances in which a full investigation is practical. Even when an official investigation can be justified, many of these investigations quickly encounter a barrier: an international border. Many fraud attempts directed to UK-resident victims originate from criminals who appear to be located outside of the UK. A US Court of Appeals in New York confirmed again last week that regular old physical borders drawn on maps by cartographers continue to apply to the Internet and cloud services. The long-awaited decision in Microsoft vs United States (2d Cir, July 14, 2016, No. 14‐2985) overturned a lower court decision to issue a warrant under US law that would have required the Microsoft Corporation (resident in the US) to produce emails stored on a server geo-located in Ireland. The decision of the court ultimately turned on an interpretation of one part of the Stored Communication Act (18 USC 2703). The court concluded that when the US Congress drafted this part of the 1986 law empowering government bodies to compel disclosure of stored email using a “warrant”, that the Congress did not intend to include within the “warrant” authority the ability to compel disclosure of data stored on servers located outside the United States. Although the case prompts discussion of many issues, there is one aspect I find especially interesting at the outset. I am always amused by the perennial news item that tries to compare an online platform to a nation. Facebook has become a favourite thing for journalists and headline writers to compare to nations. Just last week we were treated to the Huffington Post declaration: "Facebook Could Soon Be The Biggest 'Nation' On Earth" (October 28, 2014) which notes that the number of Facebook users is nearly equal to the population of China. Of course the Huffington Post did not invent this comparison. Similar stories have been running for years, including this piece in the (British) Independent newspaper from 2012, and this article in the Economist in 2010. But no matter how attractive the comparison may be, we are left with these unavoidable truths: Facebook is not a "nation"; Facebook is not a "country"; Facebook is not a "state". And it never will be. In many ways this is obvious. As the Economist article stated in 2010, "[Facebook] has no land to defend; no police to enforce law and order; it does not have subjects, bound by a clear cluster of rights, obligations and cultural signals. Compared with citizenship of a country, membership is easy to acquire and renounce." During a conference discussion panel on global cyber threats, a delegate asked if maybe it was time to start an "Internet Police Force". My response? It's already here. We already have Internet police forces. In London we have two. The City of London Police are responsible for most criminal investigations in the relatively small business district known as the City of London. The much larger Metropolitan Police Service (popularly known as "Scotland Yard") is responsible for everyplace else in Greater London. Both of these excellent police services have undertaken numerous criminal investigations, and made many arrests, with respect to perpetrators who used the Internet in the commission of crime. Looking to the United States, most of the police forces of individual cities, counties, and states, conduct investigations of crimes that - one way or another - involve the use of the Internet. At the US national government level, the FBI investigates crimes falling within their special jurisdiction that might involve use of the Internet, as do the Secret Service, NCIS, etc, etc. This Christmas, Charlie Brown helped me learn how community standards can be different in two different communities. This experience helps illustrate why I believe Internet Border enforcement will continue to increase - even between "friendly" countries with similar community standards. My wife and I recently ordered some DVDs to watch during the holiday break. When they arrived, we were surprised by the rating given to one of them. 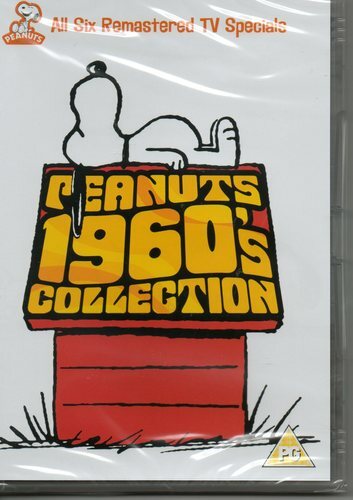 A DVD collection of six "Peanuts" animated children's specials from the 1960s arrived - rated PG by the British! "How is this possible? ", we wondered. The Peanuts animated television specials (aka Charlie Brown and Snoopy) were the quintessential "family viewing" television of our youth. Many were classics repeated every year on a cycle linked to major holidays, especially "A Charlie Brown Christmas" (1965). These almost served as the definition of "rated-G" entertainment in the USA. The Daily Show with Jon Stewart, a bastion of political liberalism, enforces geographic sovereign borders on the cyber frontier. This border enforcement, on behalf of a well known defender of free speech and democratic values, helps to illustrate the reality of internet borders that exist today. For those of you who do not follow it (shame on you), the Daily Show is a spirited satire of current US political news with a progressive point of view. As a fan, I am often frustrated that the show's main web site and associated video content are not available from within the UK. 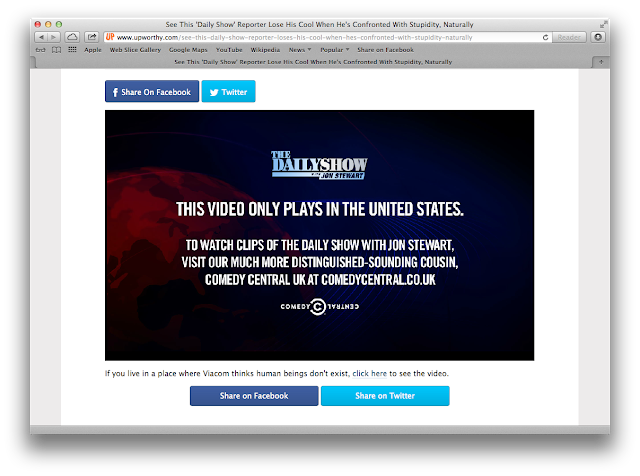 The show itself is broadcast on UK television and the UK-localised version of Comedy Central has (what seems to be) a reduced online library of Daily Show videos. Daily Show videos are often used by US political campaigners to highlight current issues. When my US-resident friends upload a reference to, or attempt to embed, a Daily Show video I often find myself blocked from seeing that video because I am physically in the UK. As you can see, the embedded content is inaccessible to those of us who are physically present in the UK. In the many years that I have spoken to audiences about Internet Border enforcement, I always enjoy receiving the comment from an audience member that usually goes something like this: "But these enforcement efforts are not effective. I can simply use [a VPN] / [a proxy server] / [the TOR network] / [whatever] to get around the restriction." I often congratulate the person who makes this comment on having become a successful "Internet smuggler" - someone who breaches a border control for their own purposes. If the mood in the room is especially light, I might even suggest that the person in question probably also knows ways of hiding contraband in their luggage to evade discovery by border officials who otherwise would stop it from entering the country. The Hitchhikers Guide to the Galaxy radio, book, and film franchise by the late Douglas Adams is one of the greatest works of science fiction comedy ever created. Part of what makes the series so wonderful is Adams' willingness to satirise social and political issues. One well-known but sometimes overlooked bit in Hitchhikers helps to illuminate an important point about the future of Internet Borders: the "Babel fish". Now that I have decided to renew my activity on this blog, I remembered that I was interviewed about the Internet Border thesis by BBC World Service Radio last year. The programme that interviewed me is called "One Planet", and they did a very thought-provoking piece about our Bordered World on 23 April 2012. You can hear the programme by CLICKING HERE. Here is a bit more explanation about my (rather down-beat) comment at the end. I do not believe that the ease of communication provided by the Internet will necessarily lead the world to a single unified global set of shared rules and values. Although there has been a lot of good and effective work to harmonise our global views of important policy issues (especially in the age of the UN), many differences remain and will not be resolved soon. Furthermore, many of these differences can be measured and defined by the geographic borders of sovereign states. While the Internet may aid our understanding of one another, it will not (on its own) lead us to a state of global agreement about fundamental questions of right and wrong. No media, on its own, can do that. The London Olympics really insists that I not be allowed to understand their site. And they have employed a next-generation border enforcement technology to make certain that I remain ignorant of the games. I live in London, England, and I understand that there is some sort of sporting event taking place in London this week. In common with many of our fellow Londoners, my wife and I decided to use this opportunity to take a vacation - far away from London. So we gave our apartment to an old American friend who is interested in the Olympics (and has event tickets) and travelled to France instead. Now to our borders story. A ruling of the High Court of England has just taken us one step further along the path of Internet Border enforcement. Twentieth Century Fox et al vs British Telecommunications has already spawned a large amount of commentary on the subjects of copyright, human rights, free speech, and modern digital society. But I think the more important aspect of this case is the implicit use of sovereign international borders in patrolling the Internet. This case is (essentially) about copyright owners trying to block copyright infringement. The allegedly infringing activity has been facilitated by a website referred to as newzbin2. But (and here's the point that really interests me) the newzbin2 web site appears to be operating from a server that is "offshore" - which is to say somewhere outside the United Kingdom. So the copyright owners want to enforce their copyright in the United Kingdom. The website is (effectively) outside the reach of a court order. Suing many thousands of people who download infringing copies is not practical. The solution? Ask the court to order British Telecommunications to block the ability of UK customers to access the offshore website. And that's what the High Court did. You can read about it on the BBC here. Put differently, this is an action by the sovereign state of the United Kingdom to enforce an import ban. So there you have it: an Internet Border enforcement order. In the two decades I have listened to debate about regulation of the Internet, one theme comes up again and again: "The Internet", I have been told, "is inherently international". Consider this. What if the Internet had no international cross-border connections at all? Would we have no "Internet"? I don't think so. What would remain would be a series of 100+ "little domestic Internets" that would all (more or less) continue to function at a technical level. If you are in London on Tuesday 19 October and want to hear more about my Internet Borders thesis, I'll be speaking at the LSE as part of a series on "staying safe online". If you are wondering how effective systems are in determining your geo-location, here's your chance to find out. I recently experimented with a few sites that try to determine the answer. You're welcome to give it a go. A few weeks ago, I complained that I wanted to know where MY MobileMe cloud was geo-located. You can read my post here. After I posted the article, I decided to do the simple thing and ask Apple. So I logged on to Apple's technical support page for MobileMe, opened a chat session with one of their support technicians, and asked "Where is my MobileMe Cloud?". I gave her a link to my article to explain the question a little better. The Apple support person was very polite, and freely admitted that my question was very unusual. What followed was about 30 minutes of very little chat while (I assume) she asked around trying to find the answer. I am grateful to one of my former graduate students who is from Estonia, who first made me aware earlier this year that Estonia had chosen to "close" its Internet border to many international gambling sites. Here's one report of the closing in a casino trade paper. The method of border enforcement chosen by Estonia is (I believe) the shape of things to come in most countries around the world, because it is less cost-intensive than building and operating a national network gateway. I was interested to see this story on BBC online. It explains that the United Arab Emirates may wish to monitor or restrict use of BlackBerry devices inside the country. What really caught my attention, however, was the concern about BlackBerry data being "stored offshore". It should not really be that surprising that the UAE has flagged this as a national security issue. With an estimated 140,000 subscribers inside the UAE, they want to know that their legal system can enforce orders that might relate to this data. I think that the future for BlackBerry (and, by the way, for anyone who provides a "Cloud" computing service) will be to re-architect their system so that it is possible for individual customer data storage and processing to take place in a defined physical jurisdiction. I suspect that the UAE (and others) will increasingly impose laws and regulations that take the form: "All communications data for subscribers who reside in our country, must be processed and stored within our country." Lesson for business: If you want to run a successful online data business, you should already be designing your online border enforcement strategy. I've been interested to read about Facebook's plans to offer "location based services". Like so many other online experiences today (especially embedded advertising), this is part of the meta-trend to customise one's experience of the Internet based upon end-user geo-location. Wow that's a lot of jargon. Let me try again. This is another side of how the Internet now "works": what you see on "the" web depends on a combination of what you put into your browser plus where you are physically when you do it. Your physical location has become a significant factor in determining what you see. So while I am certain that Facebook's roll-out of location based services is being done for the best of business reasons, they are creating one more piece of the infrastructure that will enable better enforcement of sovereign borders upon the Internet. Think of it like this: now that Facebook will "map" the geo-location of its end-users, how long before the sovereign government of Ruritania issues an order to Facebook to "block" the content of certain FB pages to all persons who are geo-located in Ruritania? Now that we know the Internet has borders, the race is on to develop technologies that will assist in enforcing them. Today I tuned into www.fivethirtyeight.com, one of my favourite sources for quantitative analysis of US electoral trends. What do I see in the top-of-page banner advertising? An advertisement for the British Liberal Democratic Party. Clearly the advertising system has made an (accurate) guess of my geo-location and served up content to match. Although my subject matter interest is US politics, the advertising market is segmented by geo-location of end-user rather than the geography of the subject under discussion. My point is this: if the Internet is truly "borderless" then this should not be possible. Conclusion: the Internet has borders. Here's a funny one for you. I have just delivered a speech at the GOVCERT.NL conference on this Internet Borders theme. You can find conference details here. I decided to log into this blog and post a few thoughts. Working from the speakers lounge here in Rotterdam, I entered the URL for my blog (www.internetborders.com). Not surprisingly, I was directed to this blog. To my surprise, the small "ribbon" above this blog that tells you I am using the "Blogger" system was written in Dutch. On the one hand, you could argue that that this is a value-added service. Blogger clearly understands that I am sitting in the Netherlands and dynamically changes the ribbon language based on a best guess of where I am. My knowledge of Dutch is non-existent. It took me a moment to figure out a work-around that enabled me to log-in. The quickest work-around was "guess the meaning of this Dutch word". What I find interesting is the assumption by HULU that content distribution can be controlled by geography. Still believe that the Internet has "no borders"?